If you are a Thai food purist, you might want to look away. Or step away from your computer. Or click on this link to a nice, tasty raspberry chocolate cookie. Because this recipe is not for you. It is not authentic at all, and I'm not even going to pretend that it is. There's farfalle in it, for goodness sake. What it is, though, is delicious. The, "I need thirds" kind of delicious. Coconut milk, ginger, garlic and lime all join the party in a dish that is full of colorful red peppers, bright green snow peas and crunchy water chestnuts. It is a one pot dish (hooray!) where the pasta and veggies are cooked in the "sauce", making for some great tasting pasta and fewer dishes to clean afterward. 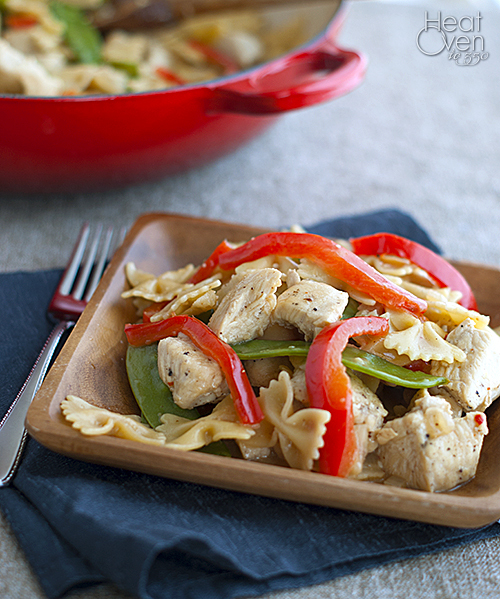 It's a great change of pace from regular pasta dishes and gives a wonderfully different option for a weeknight meal. If you like Thai flavors like ginger, lime and coconut milk, give this recipe a try. Soon. Pat the chicken dry with paper towels and season with salt and pepper. Add 1 tablespoon oil to a 12 inch skillet over medium heat. Add the chicken and cook until it is lightly browned but not fully cooked, about five minutes. Transfer the chicken to a bowl. Add 1 more tablespoon of oil to the empty skillet, and add onion, red pepper flakes, coriander and 1/2 tsp salt. Cook until the onion is softened, about 5 minutes. Add ginger and garlic and cook until fragrant, about 15 seconds. 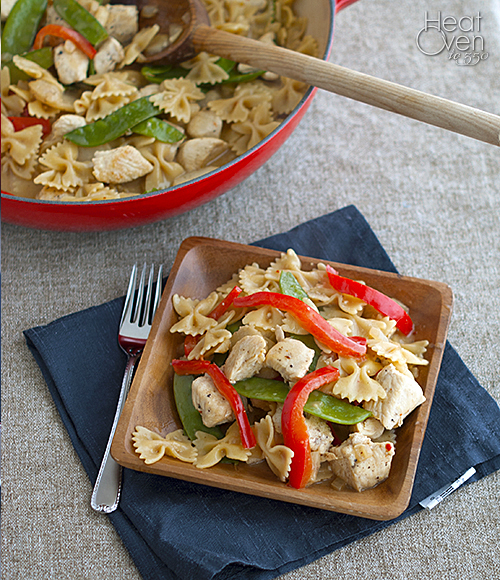 Sprinkle the farfalle evenly into the skillet. Pour the broth and coconut milk over the farfalle. Cover and bring to a boil, about five minutes. Reduce the heat to medium-low and stir in the red peppers and water chestnuts. Cover and continue to simmer, stirring occasionally, until the pasta begins to soften, about 8 minutes. Stir in the snow peas and chicken and any accumulated juice from the chicken. Cover and continue to simmer until the chicken is cooked through, about 3 minutes longer. Remove from heat and stir in the lime juice. Season with salt and pepper to taste and serve. I am not a Thai food purist and this sounds freaking delicious! I want to come live at your house, you guys have the best dinners!! This sounds delicious. I like Thai food, but I will probably never make it at home because it seems complicated. This however, I am looking forward to making.